Baked with coconut in the cake, filled between layers and frosted with toasted coconut frosting, this cake is then topped off with a layer of coconut. 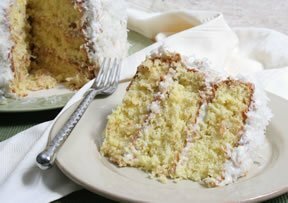 This scrumptious cake recipe is sure to please any coconut lover. Sometimes the best decorated cake is just one that looks delicious! See tips and advice on how to best prepare your cake to achieve the better results when decorating. See many step-by-step instructions that will help you when decorating cakes for all your special occasions without being a professional cake decorator.